His journey started with a small step when he kicked a ball for the first time in his life a year ago at one of Slum Soccer’s bi-weekly training sessions. Soft spoken, shy and reticent Pankaj has had a tough life. Born into extreme poverty, an abusive alcoholic father only exacerbated his woes. Despite belonging to a family that had a roof over its head, it was never home and Pankaj often found himself on the streets after being on the receiving end of a beating administered by his drunken father. All of this changed when Pankaj discovered football. From someone who had always been a victim, he blossomed into a leader at the center. This did not go unnoticed and he was immediately identified by the Slum Soccer team as someone who was destined for big things. After the National Championships, he was put through the organization’s Youth Leadership program. 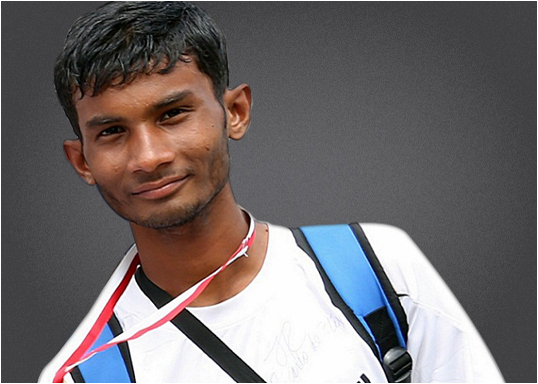 He received his call up to the Indian National Homeless World Cup squad and continued to go from strength to strength. After a brilliant campaign at the Homeless World Cup (India finished at an all time high of 29), Pankaj returned to a hero’s welcome. He had won his team over with his inspirational behavior on and off the pitch. He was welcomed by his local politician and members of his community who were waiting for him with garlands, music and fireworks. He is now a local superstar! In the coming days, ‘Captain’ as he is now known will visit all of Slum Soccer’s centers and share his story with others in real need of inspiration. And we’re confident they will get it from him.